The packet of information and book I received helped explained the problem and the works. I thought the crew did an excellent job. I was very satisfied with the work done. 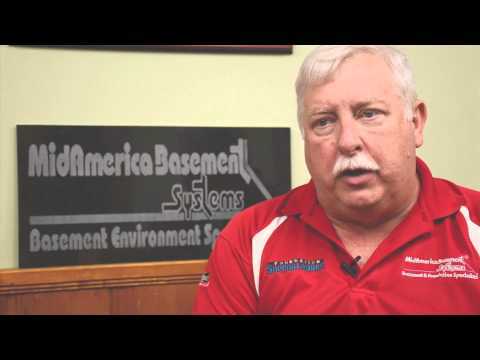 I am satisfied with the work done by MidAmerica Basement Systems. The crew did a good job and were courteous. I also thought the office staff and representative were helpful and courteous as well. I wanted to let you know how pleased we are with the baseboard waterproofing work that your crew (Howard, Chuck, Tim, & Bill) did for us in June. We've had enough rain since then to prove that this systems wrokrs extremely well and its durable. My two children us that area to play in and to date no problems! I was also pleasantly surprised to see how quickly your crew repaired a pinhole leak in the channel caulk. Prompt service after the sale speaks volumes! I'll not hesitate to recommend Midwest Reconstruction's basement de-watering system to my friends and family. Howard was personable and we enjoyed him. His presentation was very helpful too. I saw your company at a home show and felt like this was the right way to go. Your office employees were also very polite. I have had your company do work for me in the past and was pleased with that work. The crew who worked on my driveway was great. They worked hard and were polite. The office staff was very helpful and smoothed out any issues for me. We looked up your company in the phone book when we realized we has a water problem. It sounds like your company knew what they were doing so we went with you guys. The installation crew was courteous. They were respectful of our home and clean up nicely when they finished. The representative and the rest of the staff was also courteous and helpful. All of our questions were answered. No one else that we contacted was interested in doing the job except you guys. All the men did a very good job. We were well satisfied with the work done. The office staff did a good job as well. I thought the crew, office staff, and Howard were all very helpful and courteous. The job looks great. I was very satisfied with the outcome of the mud jacking. Thanks. Your company had the capability to do two different jobs, our wall anchors and helical piers, and the bid was comparable to competition's. The men on the installation crew were hard workers. I was very satisfied with the crew and the overall outcome of the jobs. Your company was highly recommended by past customer and we felt that the price was very reasonable. We also felt that you did an excellent job and will use you in the future if the need arises. We are very satisfied with the work. The crew was very easy to work with. Howard did a very good job at the appointment and we had a great experience with the office staff. Howard has spent over 30 years in business management and customer service. During that time he also attended college and graduated with a degree in Business Administration. Realizing what a great asset Howard would be, Midwest Reconstruction/MidAmerica Basement Systems recruited Howard in 1994. Howard received extensive training on waterproofing at the Basement Systems International Waterproofing Contractor Network Headquarters in Seymour, Connecticut where he ultimately earned the highly esteemed title “Certified Waterproofing Professional.” He also attended training for foundation repair in Omaha, NE for foundation repair and earned his Foundation Supportworks certification. Howard also attends annual dealer training conferences. Howard began with installations, where he installed more than 400 systems with his own hands successfully. In 1995, Howard acquired 47% of the company’s stock and became Vice President and General Manager. During September of 1997 Howard purchased the remaining 51% of the company’s stock and became President of the company. MidAmerica Basement Systems/Midwest Reconstruction is the exclusive regional dealer for the Basement Systems International Waterproofing Contractor Network – a group of 300 of the best basement waterproofing contractors in North America and the world. This network has exclusive access to patented products, comprehensive training, and exclusive certification testing and support through the national company. MidAmerica Basement Systems maintains a top 20 national dealer ranking in this network.The company also does extensive foundation repair, and is the exclusive regional dealer for Foundation SupportWorks, where we maintain a top 20 national dealer ranking. Howard has consulted with over 7500 homeowners and designed effective solutions for them. Howard is a trusted and valued member of the Basement System team and Foundation Supportworks team. 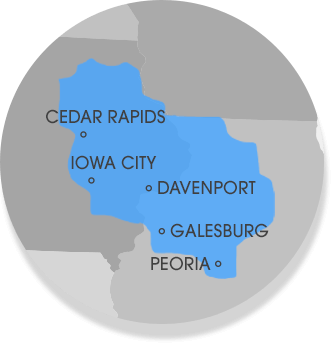 Howard served on the Basement Systems National Dealer Council and as a member of the Iowa Homebuilders Association, National Association of the Remodeling Industry (NARI), the QC Homebuilders Association, and Davenport One. Have You Heard Our Crew Reviews? Valentine's Week Employee Appreciation Breakfast!